So this weekend’s jaunt was a repeat of last weekend’s run from North Berwick to home, but this time carrying luggage. Lev’s panniers weighed 1 stone 8 lbs (9.8kg), and contained most of the things I think I’ll take in August. I have no idea how much Fidel’s panniers weighed, but rather than faff with packing lists, Elly quickly filled them with old copies of the London Review of Books. Here’s the inevitable cyclemeter map, and below is Lev’s panniers’ contents. 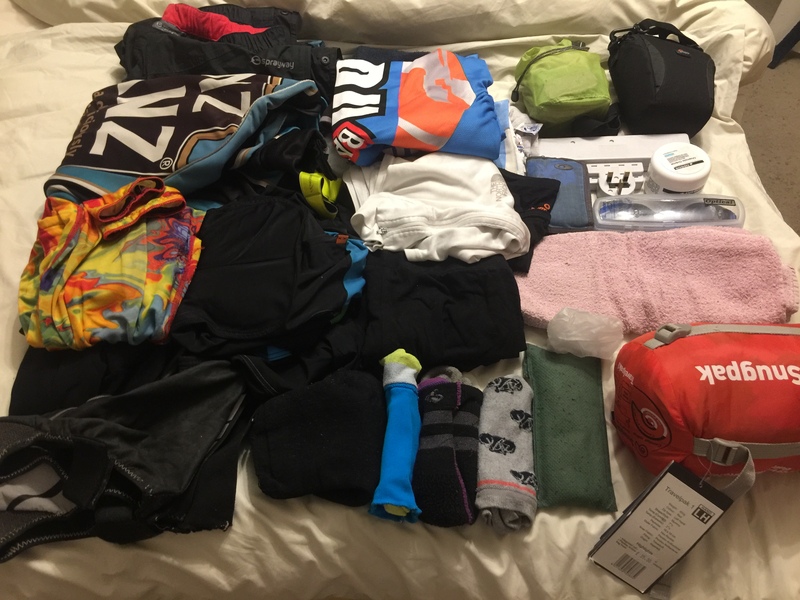 There’s a PDF of my packing list here just in case you’re really interested. Both Elly and I felt much better than last week when we started off. While my left calf still announced its presence from time to time, I did feel it limited me any more than any other part of my propulsion system. I enjoyed having a payload to push against, or at least an excuse to be slow. For the 16 miles (to Musselburgh), cyclemeter told me I could cruise at around 14mph – on the flat – and that my average speed was 12·9 mph. In fact, I enjoyed almost all of this jaunt. It might be because I knew the route and so could just settle into cycling, or because this time I used chamois cream and so set off tingling, or simply because it was a second weekend with good cycling weather, or all of these. I got home feeling as though I had at several more hours of cycling in me, although not at any great speed (even for me). Any uphill gradient almost immediately cut my speed to under 10mph. After Musselburgh, my average speed dropped appallingly. Part of this was due to traffic queues and Edinburgh’s appalling road-surfaces but I didn’t have these excuses once we’d got onto the cyclepath from Lindsay Road to Haymarket. I began feeling slightly hungry after 30 minutes, but didn’t do anything about it until we stopped briefly at Prestonpans, by which time my blood-sugar was quite low. I’d been afraid of dropping my blood-sugar meter while moving, and I hadn’t wanted to stop. So I need to be more aware of what’s happening inside me, get better at ‘in-flight’ refuelling and other acrobatics, and to put a lanyard on my meter. I didn’t get to try the SPD sandals that arrived on Friday. Despite supposedly being my size, they were too big. So they will be sent back tomorrow, and a smaller size has been ordered. Elly is still faster than me – by the time we got to Prestonpans (about 13 miles), she was over a quarter of a mile ahead of me. I should be able to carry all the kit I want in just 2 rear panniers and a rack-top bag. I think I need to make sure I can do 40 miles carrying kit, function for the rest of the day, then do it again the next day. This entry was posted in Amuse-Bruce, cycling, out and about by Bruce Ryan. Bookmark the permalink.